Still Praying for you every chance I get! You're such an amazing person Kandee. You have thousands of hugs and prayers coming at you. You've given so much hope to everyone, now we are here to give you the same hope back. This isn't going to get better soon, and you can't just get over a death soon, maybe not even ever, but I know that your dad wants you to be happy again some day and that he wants you to continue to share the love you've given people, whether it be all over You Tube, or even just at home with your children. We love you dearly and will always be here for you, no matter what. So much hugs!! You've helped me and plenty others so much through hard times with your inspiring words. I hope you're getting all of the kindness and caring back from all of your followers. Awww! Dearest Kandee!! So very sorry for your loss! Ill keep you and your family in my prayers. Hugs!! Praying hard for you! This song had helped me through some very hard times as well. Thanks for sharing it in your blog post! Most people say that it gets easier over time. That time heals. In my experience, time tends to make it harder. Though it seems harder, time allows you to learn new way to cope with feelings. God also helps. Praying that God heals your broken heart, and your black eye.. Haha Thank you for sharing such a deeply personal experience with all these people tht you don't know. It helps to know you're not alone! Praying for you, kandee. You're such an inspiration, and your heart touches so many people. Keep listening to your heart and continue to let your bright personality carry you through this rough time..... Thanks for all of your advice, kind words, and insight to a happy life.... I don't even know you but you always make me feel better. :) keep smiling. You are so loved Kandee, my heart breaks for you and your family. You will see him again, "when we all get to heaven, what a day of rejoicing that will be!" We all have victory in Jesus over the pain life throws at us and when we are all finally reunited in heaven the pain will be over for eternity! I love that song and it has gotten me through very difficult times. I have been praying for you and your family this past week and hope you guys find peace. Huge hugs from Texas! Its been 17 years since I lost my dad, a stroke brought on due to diabetes. The pain never goes away, it jus gets easier to deal with. As time goes on, you learn to not cry over the loss, but to remember and revel in the happy days. The days when you were together and it was nothing special, but you and your daddy having a talk about fishing. The first time he held his grandbabies and the pride that poured from his soul. Please know that as you hurt, we hurt for you. He helped you become the woman you are, and that is an extension of him. Our thoughts and prayers are with you and your family. I know this sounds silly but one of these days you'll be able to wake up and forget to be sad. :/ You'll never be able to forget your father but the agony will subside. Love is hard b/c it is everything. If it was easy it wouldn't be worth anything. Still praying for your family. Even in your deepest grief you exude grace, kindness, and positive energy. You are STILL inspiring me even in your worst moment. My heart breaks for you and I am praying and thinking of you and your family. Know how much you are loved and how VERY PROUD your dad is of you up there in heaven!!! Much love to you and yours. I'm not going lie to you because honestly it will never be the same. 10 years from now your going be sad and missing him as much as you today. You see I lost my dad ten years ago in november. He wasn't suppose to die when he was so young, hell when I was so young. I miss him every day and each time a new milestone hits I wish he was here to see it. But promise you the pain does ease and you carry on like we are forced to. I remeber it was a couple weeks before I slept, ate, or could even function. But eventually we push on and the pain easies. I'm sorry that you are going thru this. But I'm not going to pretend everything will be fine and that its all ok. All I can say is I'm sorry. Time does heal but right now its like open wound and nothing feels right. Just hang in there you will come thru this stronger than ever. Hugs, tears, and prayers to you. Still praying for everyone shaken by this tragedy. You are one of the most inspirational humane beings. You have helped me, even when you didnt know. I hope you will be able to return to your happy self again soon, in fact I know you can. Your dad is now you amazing guardian angel. Here from Spain, from thousands of miles away, I would like to send you all my strenght, your father will always walk by your side. Kandee my hearts hurts for you even though there's nothing anyone can say or do to take your pain away know that you are loved and that we're praying for you and when u start to think about your dad not being here take a little comfort in knowing that god loved your dad so much that he was ready for him to go back to heaven but know that your dad is always with you and he's smiling down on you!!! I love you Kandee! I hope that you know you are in so many of your fans hearts. You inspire us all and I hope you can find comfort in that. You will see your Dad again. So much love!!! Kandee you and your family are in my thoughts and prayers and my love goes out to you. This sure has been a tough week. A friend of mine's 17 yr old little brother was killed in a car accident on Father's Day, he too was a young father. A week before he had just graduated high school and was going to have a huge graduation/birthday party this weekend since his 18th bday would be on Monday. Seeing the pain my friend and her family are going through tears my heart to pieces and I know you must be going through the same emotions, but one thing to remember is..God does not give us more than we can handle! Much <3 and prayers your way! I feel like I know you, like your a friend. I was happy to have seen a blog from you in my reader. I lost my mom 17 years ago. I was too young to be losing my mom. I remember watching the sunrise and thinking how something so pretty shouldn't be happening. Later, I couldn't understand how people just went on like life never stopped. How could they smile and laugh? I've come to realize that the saying "time heals all wounds" is false. You will have pain but as time goes on, that pain becomes easier to bare. 17 years. She's been gone that long and I still can't listen to the song "One Sweet Day" by Mariah Carey and Boyz to Men. All that to say I know how you feel and I hope and pray that you receive so much comfort and support during this time. Please don't let this keep you away from your passions and from encouraging others. I know firsthand how something can take control of your life. Don't become a prisoner to that. Stand strong. It's okay to hurt and it's okay to wonder why. God says we go through life and with the comfort we receive during our times of struggle we will ourselves comfort others during their times of heartache and troubles. Hugs your kids and cherish every moment, as I have no doubt that you already do. I am very sorry for your loss. You're so inspirational to your readers and hopefully we can all help you through this difficult time. Your dad is looking down upon you and would never want you to have to give an excuse for that beautiful smile. Mourning him should include not only tears for your sadness but smiles for the wonderful memories. Kandee I am so sorry for your loss. I've never lost a parent but have lost many close to me. I am praying that God, the ultimate protector and healer, would overwhelm you with comfort. May you be wrapped tightly in his arms. You are close in my heart and prayers. I have always said that if it wasn't always something then I guess there would be nothing. Sorry you're having such brought time. One day at a time! Just remember that the sun will continue to rise and set. We cannot change the things that have happened, just our reactions to them. Allow yourself to hurt, it's not an easy thing to deal with. Time is on your side. You're so brave to be dealing with the loss, while still being such an amazing mother to your children. Your dad would be so proud of you! Jesus continue to be near to Kandee and mend her heart like only you can. Take a hold of her life and give her your beautiful hope. Restore her peace, her joy and vibrant heart for life...bless her tremendously during this time. Amen. Big hugs to you beautiful lady. My dearest kandee, may my and others' love and prayers for you and your family reach your heart and help ease the pain. Let the strength you have bestowed upon all of us through the years meet you with open arms. We are here for you. You have His and our shoulders to cry upon. I'm sending you tons and tons of hugs. Hi Kandee I just watched a video on you tube of you speaking at IMATS in New York what a motivational person you are. This is the gift the Lord has blessed you with. I can only imagine how everything seems so far away to you, how you are walking through the darkness. Please know that we are all waiting for you on the other side I pray for you and your beautiful family every day. You inspire us so much we just want you to know we are here for you too. Love you Kandee we miss you God Bless you. Hang on to Jesus He will see you through. We all love you and are inspired by you. Your dad is proud to see that you have touched so many lives. He is in your heart & smiling on you and your entire family from Heaven. I know it doesn't cure the pain, but I hope all of our comments let you know that we are all here for you- to listen & love you. Even though we aren't there in person, we are still here just for you. But as God calls us one by one, the chain will link again.- Anon. 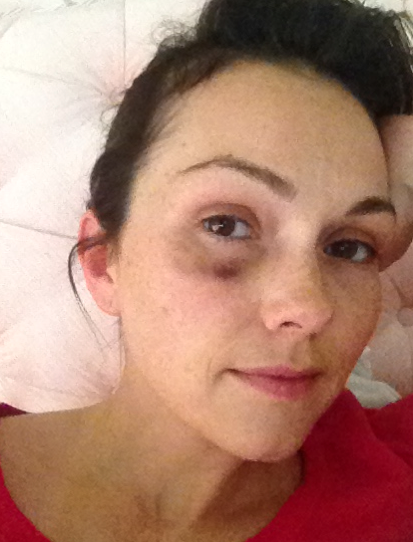 Poor Kandee. Why do bad things happen to good people? 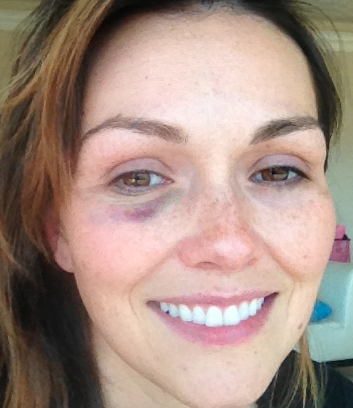 You still look amazing even with no makeup and a black eye because you have true beauty. But you have to smile for me. Cuz thats my favorite look for you. Kandee, I think you are all around amazing. I know thats not much that can heal a broken heart other than faith, but I just want to say each day when life feels like its this crazy ride that's about to just completely knock you down ,"Take it by the horns, Grab on tight, Don't Let Go, and Scream." The same day you got the news about your father, I stood by my grandpa and watched him take his last breath. Death is not natural and somethin one can never get used to. But prayer and faith will help you thru the hardest times. And remember 1corinth10:13. God will not tempt you beyond what you can bear. So just know that you are STRONG! <33 lots of love and big hugs, Jazmin.